I was in a meeting the other week with a client. I was giving them an update on online marketing and I suggested that they should seriously start thinking about blogging and building their online brand awareness as a way of driving traffic to their websites. The client asked ‘if something that’s written about your company that isn’t good – can you get it deleted off the forums or blog or similar’. Once I had picked myself up and dusted myself down – I tried to explain that would be the worst thing that they could ever do. Why are companies are so frightened of only being custodians of the brand and opening the brand to their community? If someone has a bad word to say about your company, this should be a prime opportunity to put right a wrong. It also gives you an opportunity to demonstrate to the online community that you are engaging with them and take their opinions seriously. Shunning them can only lead to a back lash. I remember when I worked as ASDA on their graduate training and they introduced the ‘no quibble guarantee’ at customer service. The customer services team at the specific store were up in arms – worried that all the customers would scam them and ASDA would be out of pocket. My parallel online is that if companies operated a feedback welcome policy online or got involved in twitter or forums, there would find that the feedback they got overall probably would be positive and could only boost the online traffic and brand awareness for the company….if only they would take that leap of faith. Like it or not twitter had reached tipping point and it is here to stay. Remember the good ol’ days of beta or VHS videos…………companies that are early adopters of twitter will grow their business substantially online. Those who stick there head in the sand will be like the beta videos and will become extinct. Personally I don’t agree with the article. I have been in the online marketing industry for over 12 years now. Back at the start when Google was launched – search engine optimisation was prehistoric to where the technology and techniques are currently. Likewise for twitter as new tools and techniques develop – this will open it up to the general public, not just the early adopters and will become a new form of online marketing. However, those companies that did realise the potential for search marketing, soon enjoyed a new source for generating more business……for those companies which ignore twitter and other social media sites….do so but at your own peril. SearchWiki – being tested in Adwords? Back in November Google launched SearchWiki where Google Account users can modify search listings. I did a blog posting about it in January. Using Search Wiki, users can add, delete, amend or comment on a listing. So what’s big about that? Google stores this data so you can view other people’s combined results. So ultimately I can see Google integrating this into the search algorithms. So the listings on your website would be influenced by your visitors overall experience of the website / company / customer services etc. Since I read the article in November I have long seen this as a new tool to be integrated. Google Adwords – is this the test? Today there are articles on Search Engine Land and E Consultancy both saying that they have seen this being tested on Google Adwords. The question of the moment is that if enough people remove the ad will it effect the Quality Score on the PPC………is this is the software being tested in earnest. I guess if the testing is successful then it might get rolled out into the search listings. So what does this mean for Ads and natural optimisation? Companies need to engage with their customers online – either through blogs, twitter, getstatisfaction.com……..as this could be a turning point and unless you’re an early adopter you’ve missed the boat. 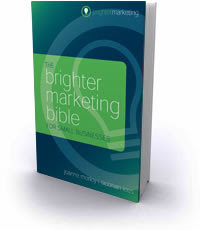 Brighter Marketing Bible – how refreshing! I have known Joanne and Siobhan at Brighter Marketing for sometime as we set up our businesses at the same time (I set up Pollenation Internet which I have subsequently sold). So when they approached me to give them my feedback, I leapt at the chance. They have supported me through some tough decisions and wanted to give back! The book is aimed at making marketing simple and easy to understand for small to medium businesses. It is written in bite sizes chapters that are easy to understand with techniques / tasks that are relevant to a small business. I am believer in life long learning and always have a business book on the go. I have read many marketing books and have always felt overwhelmed by the content and find it hard to put into practice. This book couldn’t be more different – relevant, focused on business and simple ways to implement ideas. I was at my brothers this weekend and made chocolate muffins with my nieces. I went to Google to search for buttercream icing and got the warning on all search engine listings ‘ malware warning: “This site may harm your computer,”. I initially thought it was the MAC I was using but then decided it had to be Google and perhaps it had been hacked or something. Anyhow, it didn’t last for long and I got the recipe (and the muffins were yummy!). I then wondered what was the impact of this glitch on traffic to websites on Saturday and if this had a real impact on the bottom line for companies. I hear that it was down for 1/2 an hour and the data from the website analytics would reflect this. Looking at the websites that I manage, this downtime in Google must have been for quite a short time – as there is no correlation in a drop in traffic or sales for that day. The traffic was slightly lower than for other saturdays but who can tell what is an average day anyway in these erratic economic times!